The London Library is one of the world’s largest independent lending libraries, and one of the UK’s leading literary institutions. It was founded in 1841 on the initiative of Thomas Carlyle, who was dissatisfied with some of the policies at the British Museum Library. It is located at 14 St. James’s Square, in the St James’s area of the City of Westminster, London, which has been its home since 1845. 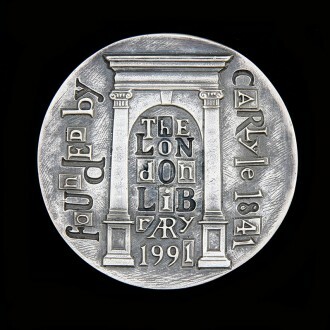 This medal celebrates the 150th anniversary of the library. 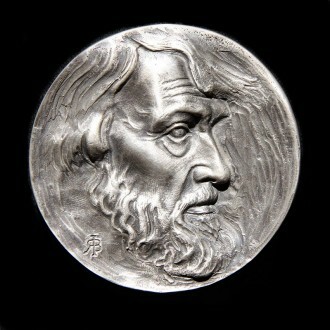 The obverse shows a portrait of Carlyle based on the early contemporary photograph by Julia Margaret Cameron. The reverse uses the architecture of the library doorway and examples of lead type to create the design.